Basement is an important part of any house. A basement needs to be in proper working condition else the house may be impacted structurally and cosmetically. Basement is an additional space usually used for storage. Large or small, ranch or colonial, this room is the foundation of your house. If the foundation has problems and needs repairing, the whole house suffers, both structurally as well as cosmetically. It is therefore important to inspect the cellar before you buy a new home or remodel the existing one. Start with inspecting around the exterior, but there are many other things in the interior as well which should be checked thoroughly. From severe to common basement problems, it can range from cosmetic to catastrophic. The two common types of issues can be wall problems or water problems. There may be mold growing everywhere, water getting collected in the basement, cracked, bowed or chipped walls, etc. Such issues need attention and they can be fixed. So, following is the list of some common basement problems which you may experience. Basement leakage or flooding is due to many reasons. It can be because of the outside or inside the structural issue. Catching the leak is vital to save your basement from flooding. If you can see feet of water in your basement already, then you need the help of a basement foundation repair company immediately. 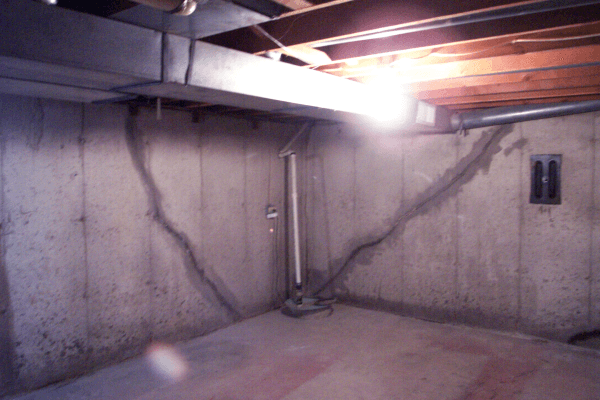 Common signs of water leakage in the basement are seepage at cove and seepage through the cracks. If the sump pump is running nonstop or is disturbed by a lot of water or if is not working then you need to get it repaired. Failing sump pumps should be addressed as soon as possible because the pump is the heart of the system and if it will not work properly, in no time you will see a flooded basement. Plastic sump pumps overheat and fail to work so get a good quality sump pump. Leaking basement wall and floor cracks lead to flooding. Cracked bowed and tipped walls is a serious issue too. You may notice cracks are wider at the top and floors are not at a proper level. Windows and cabinets may not shut properly due to this. Some severe signs are cracking of upstair plaster or drywall, cracking of exterior brickwork, cleaning of outside porches and chimneys, etc. Finding and monitoring the cracks is important as most of the cracks form at tie rods, windows, pipe penetrations, etc. One crack leads to other and therefore you need to call an exterior basement waterproofing company quickly to address the issue. Basements are dark spaces and therefore these are damp and full of moisture. Moisture can condense on the metal surfaces forming rust. Mold and rust should be stopped from thriving in the basement. These are potentially serious issues as mold will damage the clothing, books and other materials. It can affect your health too. Getting rid of basement humidity is important. So call the waterproofing company to assist you with mold formation and basement humidity problems. If you experience a foul smell then it is alarming. Odors waft through the home. Who wants dust mite deposits, mold spores, dead animals, animal waste, etc. spoiling the basement? You need quick solutions to stop these smells. If you see the paint flaking and chipping or deposit of white powder, dark or red patches at the basement walls then take immediate steps to clean the ugly concrete. Signs of bowing, buckling and other signs of fatigue on the walls need a serious look. Damaged walls can get worse quickly and in extreme cases, you will see a failed foundation. If you see basement floors settling down and notice sinkhole under the basement floor then call foundation wall waterproofing company soon. The need of pulling out the entire basement floor may be necessary. Fixing the shifting basement floors is important to keep the structure in good condition. If you see rust and rot on the window or leaking water then it is not a good sign. Weeds and trees growing in the window well and needs basement window leak protection. Windows can rust and corrode over time. If the windows are dirty and drafty then it needs to be cleaned and may need some paint too. For water, a basement contractor will use a special channel so the water can be directed in the perimeter drainage system. These problems can impact the structure and construction of your house. However, you can deal with most of these issues by getting in touch with a reputed basement waterproofing company near your area. Choosing a renowned company is the solution to these basement issues and the following link can help you implement a strategic approach to find a local company. A reputed company will send a structural engineer or a knowledgeable employee to run a basement analysis. In no time, you will be able to use your basement again without any worries.